Sophia Barrett is a trained counselor who helps patients deal with their burdens. After taking time off because of a tragic accident, Sophia returns to work. However, when she meets a patient who has similar troubles as her, Sophia realizes she hasn't dealt with her loss. Deciding she needs some space and time to heal, she heads to Cornwall, England to heal. She moves into an apartment above a charming bookstore where is she surrounded by her favorite thing: books. Will Sophia be able to heal from her past trauma? Ginny Rose is the bookstore owner and she is desperate to save her husband's dream business. She can't even ask her husband for help as he decided to take a break from their marriage. She is trying to keep her husband's dream alive but, she feels that she is missing something in her life. 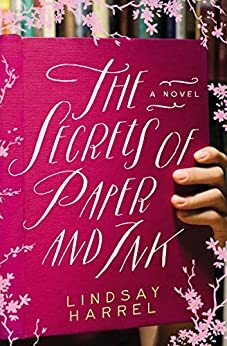 But, with an unexpected friendship emerges between her and Sophia; Ginny is hopeful that together with her brother-in-law, William, they can save her bookstore. Will Sophia be able to save her bookstore and find herself in the process? While organizing the bookstore's rare book inventory, Sophia finds a notebook containing journal entry from Emily Fairfax. Emily was a governess who lives in Cornwall more than 150 years ago. Emily has a secret dream of being an author and she writes about her secret crush on her childhood friend, Edward. However, Edward is above her class and their union would be frowned upon. Sophia is drawn and feels connected to Emily's story. Curious to learn more about Emily, Sophia enlists William and Ginny to research Emily's past. Together, Ginny realizes that she wants to save the bookstore on her accord and not because she thinks it would save her marriage. Sophia finds a new purpose and a way to heal during her journey with Ginny and William. I thought the novel had an enjoyable but, predictable story. The author's idea of combining three different points of views of the women added an extra dimension to the story. It allowed the readers to understand and feel for each character. I enjoyed seeing two strong females helping each other heal and move on. However, if you are expecting a novel with secrets, suspense, and thrills, you would be better off reading another book.